The publication of the Stiglitz-Sen-Fitoussi report in 2009 brought the question of national wellbeing measurement and statistical priorities very much to the fore for official statistics. The basic premise of this report was that while major economic indicators such as GDP are useful measures of the overall progress of an economy, they tell us little about the actual economic well-being of citizens, the distribution of economic success or failure amongst citizens, or the wellbeing of citizens more generally. The report argues that while GDP measurements are useful, other indicators such as health, education, and social connectedness are required to supplement the more traditional economic indicators in measuring the progress of society. Substantial work has been carried out on this internationally, notably in Canada and the UK, where new and existing data has been blended to provide an indication of national wellbeing. Resultantly, the CSO is currently developing a set of wellbeing indicators for Ireland. The proposed wellbeing data release will be biennial and will include 8-10 domains of wellbeing, consisting of approximately 8-10 relevant sub-indicators. These indicators will include Governance and basic rights, Health, Education, Employment, Relationships and surroundings, Psychological Wellbeing, Public safety, Housing conditions, Natural resources and Environment, and Economic Indicators. In this presentation, Damien Lenihan from the CSO will provide a historical overview of the international wellbeing movement and present details of a proposed new wellbeing indicator set. 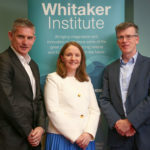 An interactive feedback session facilitated by Michael Hogan, School of Psychology, will follow, which will allow members of the Whitaker Institute to comment and feedback on indicators. This feedback will inform further development of the indicator set. Hogan, M.J., Johnston, H., Broome, B., McMoreland, C., Walsh, J., Smale, B., Duggan, J., Andriessen, J., Leyden, K.M., Domegan, C. and McHugh, P., 2015. Consulting with citizens in the design of wellbeing measures and policies: lessons from a systems science application. Social Indicators Research, 123(3), pp.857-877.